This is a very simple, yet very practical and delicious kettle corn recipe. My children love when I make these at home. You only need a few ingredients and you will not look at store bought kettle corn or popcorn ever again. 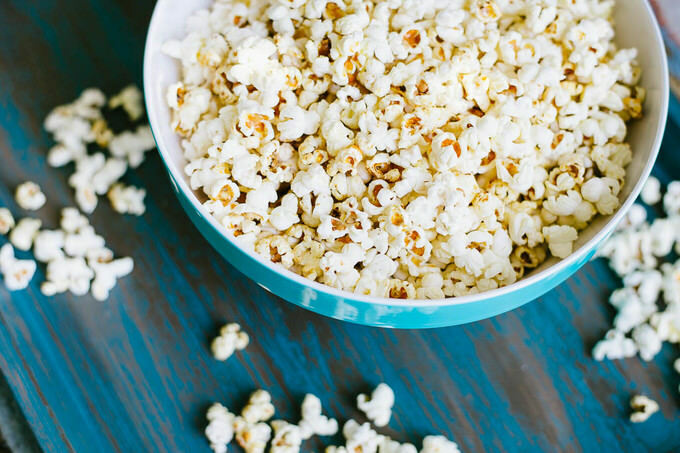 Give this kettle corn recipe a try, I am sure you will not regret it. My children love popcorn and kettle corn. The one they love most is sweet kettle corn. I am sure all of our “tiny hands” around the world can unite in showing affection to these sweet little nibbles. I make kettle corn at home quite often. 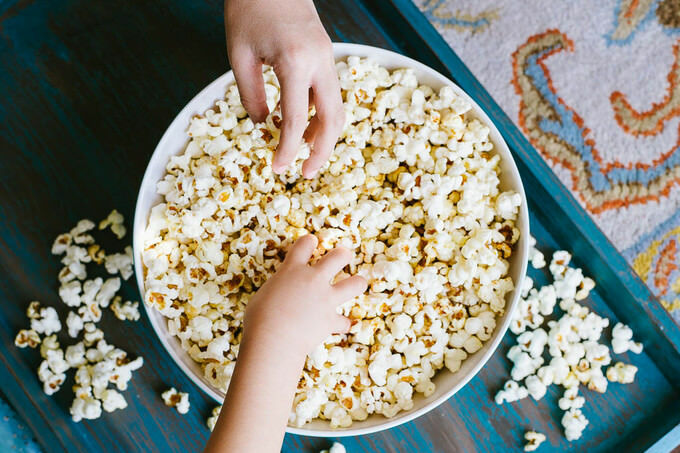 Kids ask for it for movie nights, snack time and for friends’ visits. This is a simple, yet a detailed recipe. If you have any questions regarding making the kettle corns, do not hesitate to ask, please. In the photos I will be using the Whirley Pop brand popper. These are relatively cheap on Amazon or in Bed Bath and Beyond. 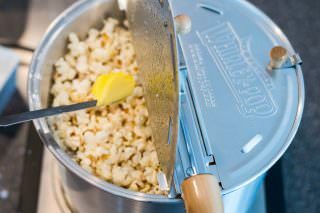 If you are going to be making lots of popcorn or kettle corn in the future, I would highly recommend investing in one. It has a special lid, which allows you to stir the kettle corn with the lid covered. Otherwise, you can use the same techniques of popping in a deeper cooking pot, dutch oven or a cast iron pots. You will just need to keep the lid covered once the kernels start popping. 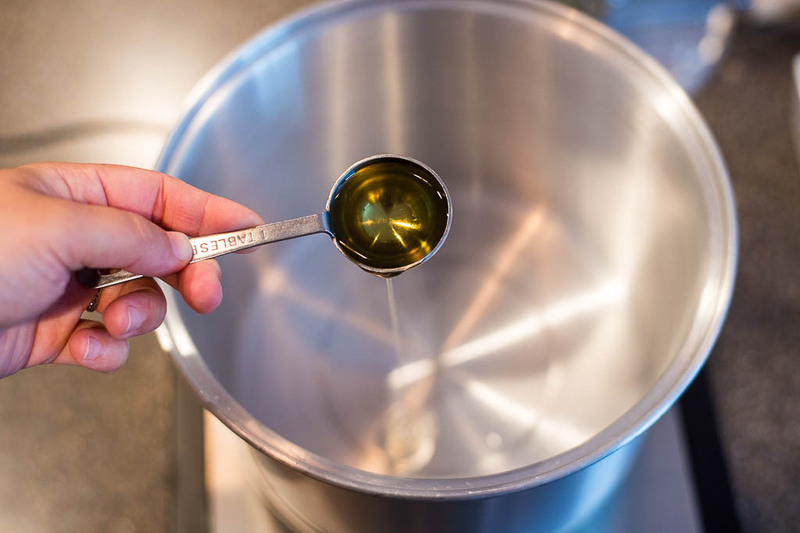 Place your cooking pot on the stove, add 2 TBSP of oil and add 1 cup of corn kernels. Turn the heat on to MEDIUM HIGH. You will need to continuously stir the pot as the kernels get heated and fried. If you do not have a special pot to cook the kernels, use a wooden spoon to continuously stir the pot you are cooking in. 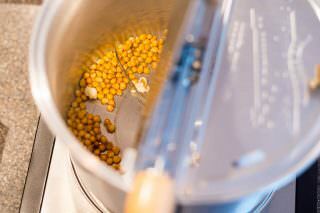 The oil will sizzle and kernels will get ready to pop. 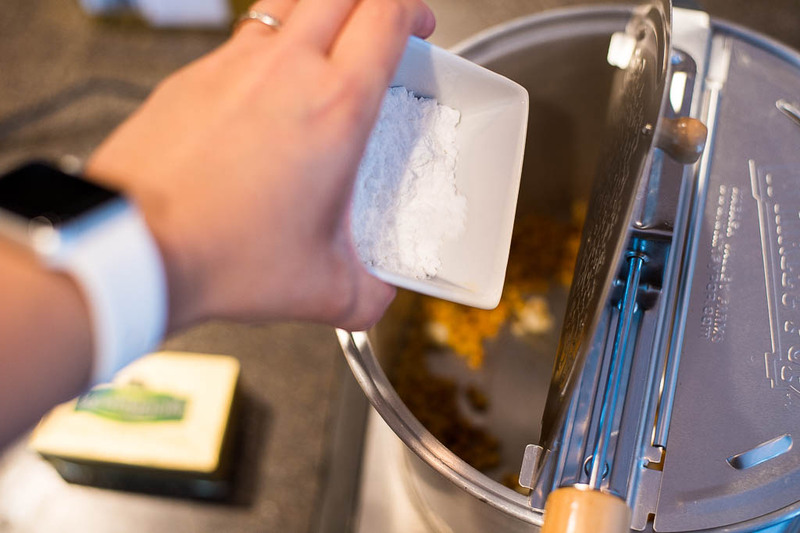 Once you notice one or two kernels getting ready to pop, add the confectioner sugar or the granulated sugar. This will slow down the popping process, just because the sugar starts melting and caramelizing. Keep on stirring the pot. The kernels will start popping. 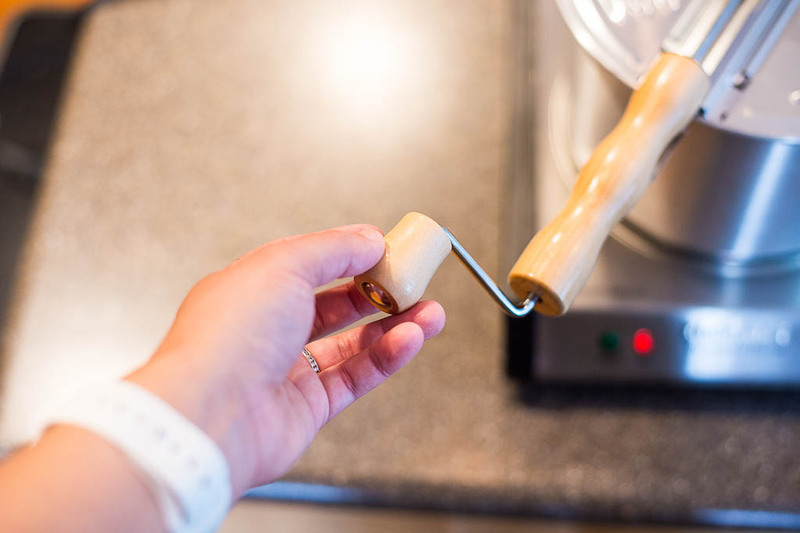 If you are using a Whirley Pop, keep the lid closed and keep on stirring. 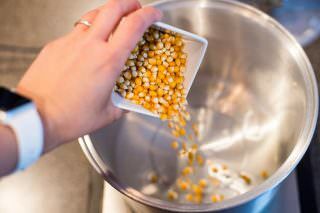 If you are using a regular pot, keep on stirring until the sugars melt and the kernels start popping. Once they start popping, close the lid of the pot. 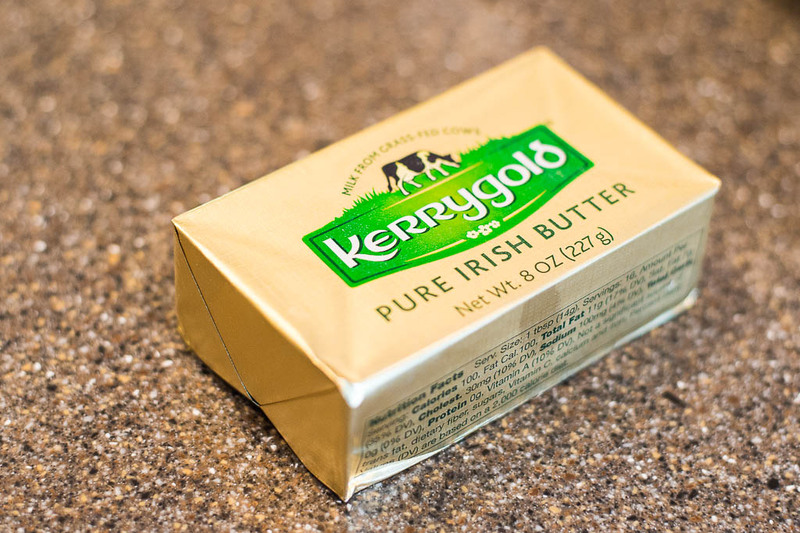 I love adding kerrygold salted butter into this mixture. It adds a touch of salt and rich balance to the kettle corn. There are multiple ways of adding butter. You can melt the butter in the begging, along with liquid oil. You can add the butter alongside with sugar, or you can add the butter after the kettle corn is ready. I like to add it after it is cooked. I add it right in to the pot, before I remove the kettle corn from the pot. 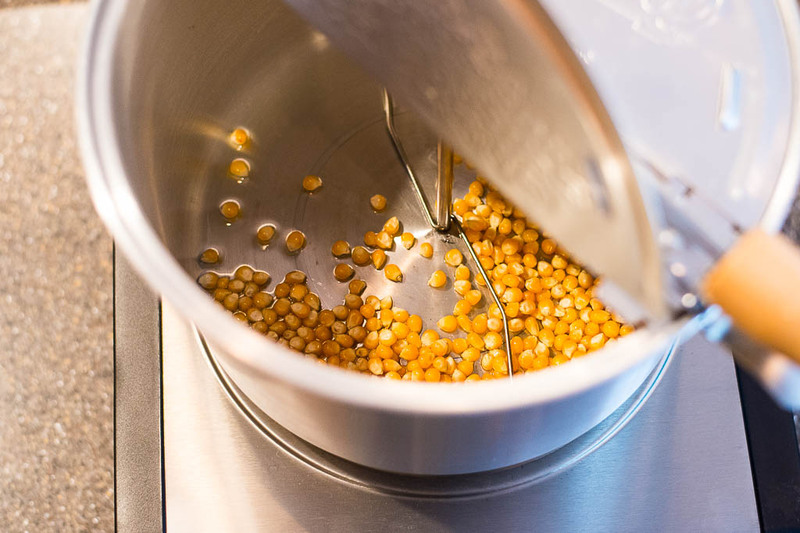 If you are melting the butter before adding to the kettle corn or the popcorn, yo can do so after taking the corn from the heat. Once you take the corn from the heat, be careful, it is going to be hot. Also, let it sit on the counter for about 5 minutes before serving. The sugars will cool down a little, and create a nice crisp shell around corns. Another method is to add the sugar after the kernels start popping. This will result in a much more fluffier, and less caramelized kettle corn. Some sugar might remain on the bottom of the pan, because sugar will not have enough chance to melt well. Trust me, if these tiny hands love dunking their hands into this kettle corn pile, yours will do to. Give this kettle corn recipe a try and let me know how yours turned out. his is a very simple, yet very practical and delicious kettle corn recipe. My children love when I make these at home. You only need a few ingredients and you will not look at store bought kettle corn or popcorn ever again. Give this kettle corn recipe a try, I am sure you will not regret it.